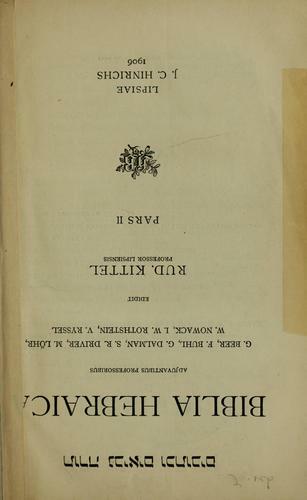 1 edition of Torah Nevi'im u-Khetuvim found in the catalog. Add another edition? 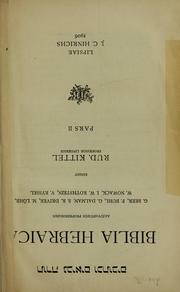 Published 1906 by J.C. Hinrichs in Lipsiae . [Pars I] Pentateuch. Josua. Judicum. Samuel I.II. Regum I.II. Pars II. Jesaia. Jeremia. Ezechiel. Duodecim prophetae. Psalmi. Proverbia. Iob. Canticum Canticorum. Ruth. Threni. Ecclesiastes. Esther. Daniel. Esra. Nehemia. Chronica. November 8, 2010 Created by ImportBot Initial record created, from Internet Archive item record.